April, 22nd! Celebrate Earth Day! Earth Day is a time to be more aware of the environment. It is a good opportunity to connect kids with nature, foster appreciation of our world, and begin to develop “green” habits. 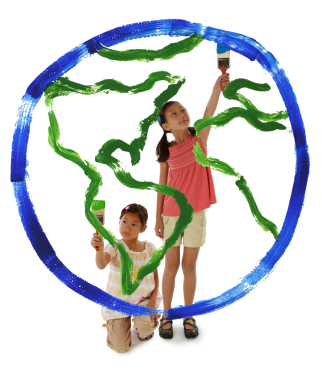 Start at a basic level and help kids understand why and how we take care of the earth. If you decide to take a real hike, keep it short and plan on frequent breaks for rest, water, and snacks. Play games, such as who can find the most different animals or plants. If kids get tired, try picking a spot ahead to walk to before stopping for a break. Be sure to discuss leaving nature the way you found it. Make recycling into a game! Have kids look into the kitchen wastebasket and tell different items they see. Ask what happens to the trash, and explain where it goes after the truck takes it away. Discuss how some items are made from materials that can be used again instead of being buried underground. Then have kids play a sorting game with recyclables that don’t have sharp edges to see who can put the items in the right bin fastest. An alternative is to cut pictures of various items from ads and tape them to index cards to sort. Earth Day is a good time to teach children about endangered species. Look up a list for your state and talk about species you have seen. (Kids may also be curious to search for images of ones they have never heard of.) Use the information you locate to explain why these animals are endangered: they may have been hunted too much, for example, or the places they live may have been destroyed by clearing or pollution. Many zoos help preserve endangered animals. Visiting a zoo is a fun excursion to celebrate the variety of animals and perhaps see some that are threatened. Ahead of time, ask children which animals they most want to see, and find those locations on the zoo map. Also check the web site for the program schedule. For example, a talk by keepers can be interesting since some animals may be hiding or napping. At the zoo, kids may enjoy looking for animals of a certain color, etc. Talk about the kind of habitat each animal lives in. Later, children could make a mask of their favorite animal by decorating a paper plate or brown paper bag. 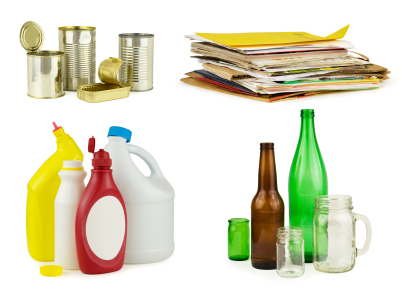 Children may be curious about how recyclable items can be used again. Point out how much of your household waste is different kinds of paper, and use some of it to make new paper! Tear discarded scraps of paper (or a sheet from an old newspaper) into small pieces. Soak the torn paper in hot water for half an hour. Then put it in the blender in batches with a little cornstarch. Strain the mixture and spread it evenly on aluminum foil. Place a dishtowel on top and roll over it with a rolling pin to squeeze out excess water. Take the towel off and let the paper mixture dry thoroughly (about a day). Walk around your home and point out things that use energy: lights, appliances, television and computer. Less obvious examples are “invisible” things like heating/cooling systems and running water. Talk about ways we sometimes use energy when we don’t need to, such as leaving the television on when nobody is watching. Brainstorm with children ways you could save energy at home. Kids may enjoy testing items, such as comparing a regular light bulb with a compact fluorescent. You can test for drafts by holding a ribbon next to the window, and test the refrigerator seal by pulling on a dollar bill closed in the door. Collect the water a dripping faucet loses in a certain amount of time and measure it. It can be fun to try and see how little energy your family can use in a day. Turn the thermostat down and dress accordingly. Keep track of how long you spend in the shower and how many times you open the refrigerator door. Decide on only one television program you will watch, or play a game instead. Eat dinner by candlelight. Afterwards, talk about which ideas you might do on a regular basis. Pick one goal and try it for the next month!